As I've noted here before, I get the opportunity to review books for Thomas Nelson Publishers. They send me a book, I read it, review it, and get to keep it for free. They ask for honesty, which they get from me, even though I do rate most of the books fairly highly. Why? Well, they don't just send me random books. I get to pick the books I want, so I have a prior interest, plus, these are books that have already been considered, vetted, edited, rewritten, and so on. Between getting books I want and the process, I don't hit many books I don't like. But, there might be first one. 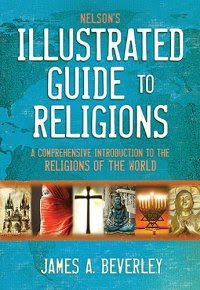 Ok, so the book is: Nelson's Illustrated Guide to Religions: A Comprehensive Introduction to the Religions of the World. The author is James A. Beverley, who is Professor of Christian Thought and Ethics at Tyndale Seminary. First question: Is the author qualified to write a resource book like this? Generally, when I look at a resource or reference book, I want to know if the author is qualified. I could write a reference of religions, but my experience and world involvement is pretty sparse. Dr. Beverley, however, has been doing academic study of world religions for 3 decades. Moreover, he's taught classes on 6 of the 7 continents, and no major world religions are based on Antarctica, which he's missed so far. So, he's read the books, he's studied the material, and he's seen the places where things generally happen. So, author qualification is there. Second question: How well does the author handle author bias in the book? In the introduction, Dr. Beverley is up front with his primary bias in favor of Evangelical Christianity. He allows the reader to know that he is examining all of these religions in light of their truth claims and history, and that his starting point is the truth of Christianity. Some might prefer a book that claims to be completely unbiased, but that's a logical impossibility. Everyone has some assumptions and biases about what is true and what isn't, the author does the reader a service by disclosing his biases. Secondly on this question, the author does not, as some Christian guides to world religions do, present each religion as a list of errors compared to Christianity, nor does he list a tips for evangelism section on each group. He does provide links to both official sources and known critical sources on each group. Third question: Is the material presented in an accessible fashion? I'd give the setup and design of this book a resounding endorsement. The use of full-color photographs and charts is easy on the eyes, and brings a realism to the understanding. Moreover, the division of the book into major sections that are similar, with individual groups detailed in each section, is very helpful. The book uses colored charts to summarize information on each group, so there is no risk of accidentally reading into another section without knowing it. All in all, I found Dr. Beverley's work satisfying, and will use it as a lending resource for church members with questions about other religions.